Door-to-door – Real comprehensive delivery, speed – Guaranteed delivery time 3-5 days, security – We guarantee the security of the parcel throughout the entire process, AWB tracking – “On-Time” tracking of the parcels. Processing – returns, inventory, automation – integration into the WMS system, transparency – online visibility of transactions and products to the end customer, support – customer care & targeted support. Ask comfortably and without obligation for an offer for your range of goods. Just-in-time delivery, collective delivery, partial or complete delivery with the obligation to receive an optimal price offer on the same day. Calculate quickly and easily the final price for your parcel delivery, with no hidden costs. You will only find the optimal price-performance ratio with us. Logistikzentrum Augsburg Contransport SRL – Foundation of the family business in 1996 and current headquarters of LZA Contransport SRL. Contransport GmbH & Co. KG headquarters – In the immediate vicinity of the A8 motorway. Due to the optimal infrastructure, with an extended road network via the A8, B2, B10, B17 and B300 as well as fast access to the major airports of Munich, Stuttgart and Memmingen, Augsburg is and will remain one of the most important centres for our logistics projects between Germany and Romania. Logistikzentrum Augsburg Contransport SRL – Subsidiary for customers, shipments and warehousing. Contransport continues to work on expanding and improving its national transport services by opening the Augsburg Contransport SRL logistics centre in Bucharest / Romania. With a young and professional team, Contransport wants to be closer to its Romanian partners as well as to its German partners by guaranteeing the safety of the goods to their final destination. Contransport GmbH & Co. KG – Subsidiary for customers and shipments, which is located between the industrial centers Hannover – Bremen – Hamburg, in Soltau. This way we want to be as close as possible to our existing and potential customers in the north of Germany. 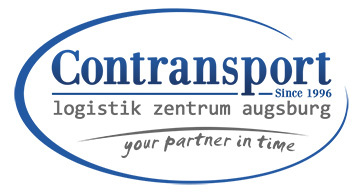 Contransport GmbH & Co. KG – Partner for transport, warehousing, fulfillment, parcel service. The subsidiary is located in the north of Italy and is a centre for the automotive industry and parcel services. We offer our complete services at 6 locations, all of which are strategically located. We also manage to be close to our partners as a team. We have the necessary experience to be a partner who is a real support for the automotive and electronics industry, where time is the key factor. are our daily destinations for the transport of your goods. We have learned new things every year and have grown. We have arrived at the point where transport and intra-Community logistics do not provide any further steps unknown to us. Thanks to our cooperation with Contransport we have managed to expand the market for Oriflame cosmetic products in Germany. It is a company that meets every customer requirement. Contransport, for 14 years our trusted partner for special transports, logistics and international transports. Since 2005 Contransport has been our trusted partner when it comes to logistics services, express deliveries and intra-Community goods traffic. We have delivered with Contransport in Germany several times. The fact that they always managed to deliver on time and to check the delivery and unloading details with the supplier in German convinced me to prefer them and to trust their services. With the logistics solution proposed by Contransport, our products are received, consolidated and delivered on time. Thank you for your support. We recommend Contransport company as a professional and trustworthy cooperation partner and we appreciate its high quality work, which currently stands out positively from its competitors. Contransport, 12 years of constructive experience in logistics services, just-in-time delivery and standard delivery with Augsburg International Romania. The Augsburg International team recommends Contransport as a trustworthy partner. Enduro Romania recommends Contransport as a flexible and fundamental partner who takes care of the needs of our customers.